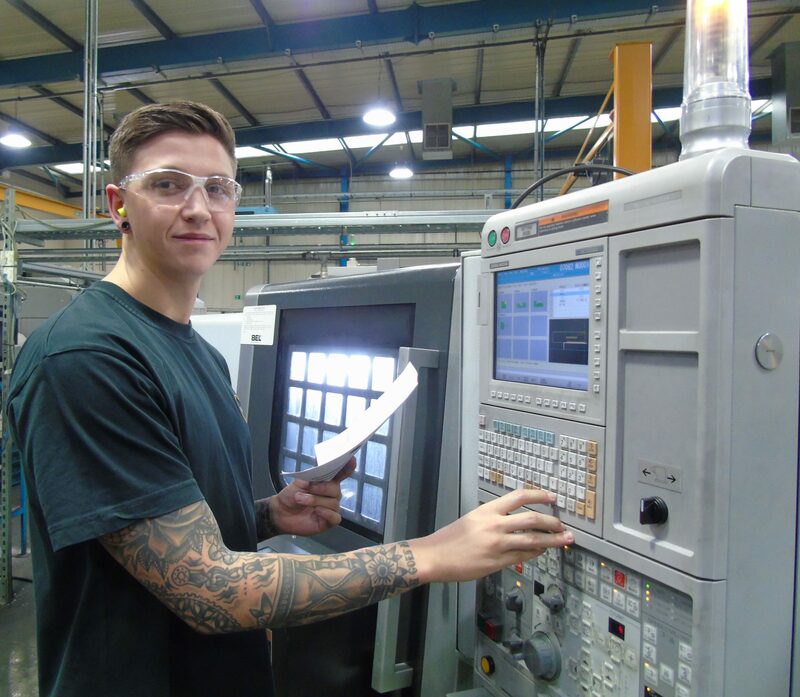 Elliott joined CMP back in 2013 on the British Engines apprenticeship scheme, fast forward six years and Elliot is now working full time as a CNC Machinist having completed his apprenticeship. We find out more about Elliot’s career so far in engineering and his progression from an apprentice to a CNC machinist. 1.How long have you worked for CMP? I have been at CMP around six years now; I started on the British Engines apprenticeship scheme which lasted four years, following on with two years of time served. 2. What interested you in a career in Engineering? During school, I knew I wanted to go into a job that was hands on, that’s why I based my GCSEs around this. I took subjects like product design and took the opportunity to train at the TDR Training School each week, spread across two years. 3. How did you train to become a CNC machinist? I spent two years during my high school career completing performing engineering operations (PEO) qualifications. The PEO’s taught me the basics of machining in a practical setting, which allowed me to progress into my apprenticeship seamlessly. 4. For someone that doesn’t know what a CNC machine does, can you explain? I receive a drawing of a part that needs to be manufactured; each drawing requires different tools so each of the parts can be shaped into the required specification. For example, to add threads to the cable glands, a tapping tool is required. After the correct tools are selected, I will then programme the CNC machine, I work on the Mazak machine located in the low volume shop. To programme the machine, I input the coordinates for the X and Z axis which moves the tools to the correct position to carry out machining of the parts. 5. What is the most difficult element of programming the machine? Sometimes I receive drawings for parts that I’ve never had to machine before, so this can be quite tricky to begin with. However, like everything new, you get to learn new things and there is always someone to support if you’re stuck. 6. Tell us about a typical day in your job? Every day there’s a new list that comes in from our planning office, the jobs for the day can range from 1 off to 1,000, so I will start my day by reviewing this list. If the machines aren’t already running from the previous shift, I will start the machine up, then check to see if the brass bar is cut, to manufacture the parts required and gather up all the tools needed. Following on from this, I’ll start setting the job which involves programming the machine. Sometimes there will be a programme available for the drawing and if so I will check over this to make sure that it’s all correct before running a one off. If there’s no programme available, I’ll write this from scratch to match the drawing. Once I have all tools together, everything set on the machine and the correct gauges to check the product, I will then carry out a first run. The first run is used to check the accuracy of the set which involves the product being checked over by myself as well as a quality inspector. 7. Do you work closely with any other departments in CMP? I work mainly with the operations departments within CMP such as production and planning. If there are any issues with tooling or drawings, I will speak to the production office to help rectify these and prevent any issues with parts during the manufacturing process. I will occasionally speak to planning with regards to overall equipment effectiveness (OEE) to ensure that the recording from my machine is accurate. 8. What do you enjoy most about your role? Every day there’s something new – I enjoy seeing the parts go from raw materials to the end product. 9. What advice would you give for anyone looking to get into engineering? It’s one of the best things I’ve done, although it seemed less like the conventional path to take when all of my friends were going off to university. Straightaway, I was working to earn a living and gaining hands on experience – I was able to learn a trade at a young age to carry forward into the rest of my life. CMP Products employs approximately 400 people worldwide and has more than six decades of experience in cable glands and similar products. To find out more about careers with CMP, please visit our careers section here.